From the Lake Regions to the White Mountains, New Hampshire is a wilderness of the best family vacation adventures. There are treasures to be found in the Top New Hampshire Family Lodgings that are sure to create lasting memories for a lifetime! Snowmobile along miles of New England trails or across the icy Lake Winnipesaukee, carve the slopes of Gunshot, take a dogsled twilight tour in Waterville Valley, or ride horseback through the luscious landscape. A new family trip experience awaits you in the Top New Hampshire Family Lodgings! For the perfect combination of all-seasons fun and simple comforts, look no further than the Mountain View Grand Resort & Spa! The perfect getaway for a family of all ages, their rooms offer White Mountain and garden vistas, rich interiors, and historic charm. You’ll enjoy custom bath and spa products in your private bath, award-winning spa services, and an indoor pool, whirlpool and sauna. More than just a comfortable stay, the Mountain View Grand Resort offers a wide variety of great activities. Whether you want to play a game at the historic golf course, relax at the state-of-the-art spa, splash in the pool, or take a horseback riding lesson, you'll find an activity to suit almost any interest on site! Kids’ activities such as the Mountaineering Club and the Cog Railway are sure to be favorites for the whole family. During your stay at Mountain View Grand Resort & Spa, check out these area attractions that the whole family will love: Santa's Village, Muddy Paw Sled Dog Kennel, The Colonial Theatre, and Franconia Notch State Park. The Tower Spa will help you relax with hydrotherapy, body treatments, massage treatments, facials, and more. Endless family fun awaits your stay at Mill Falls at the Lake on the banks of Lake Winnipesaukee. The lake is your playground at Mill Falls with its wealth of activities. The EKAL Lake Activity Center has all the supplies you need for a day on the water. Test your balance on a paddleboard or set out in a kayak. The Lake Tour is a experience for all ages as it passes under Governor’s Island Bridge and past Spindle Point Lighthouse. Of course, you could just take a swim or cast a line. Between the excitement and adventure of Lake Winnipesaukee, take a break in one of Mill Falls’ five accomodation choices. From rustic cottages in a charming forest to guestrooms overlooking the boardwalk and bay as well as docks and gardens, you’ll find a comfortable stay surrounded by beauty. Mill Falls is also home to a number of dining choices that will meet the tastes of everyone such as Lago with Old World Italian cuisine or Waterfall Cafe with comforting favorites. Relax and rejuvenate at the Cascasde Spa and premier yoga studio at Mill Falls at the Lake. In addition to Lago and Waterfall Cafe, Mill Falls at the Lake has a number of other dining options including Lakehouse, Camp, the Boathouse Patio, Giuseppe's, the Town Docks, Mame's, and the Meredith Sub Station. 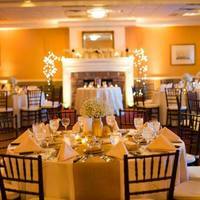 Family lodging meets classic New England elegance when you plan a trip to the Eastern Slope Inn Resort. Situated on 40 acres in the center of New Hampshire's North Conway Village, the resort is within walking distance of quaint shops, restaurants, cafes, and popular attractions the entire family will enjoy. Eastern Slope Inn Resort features 250 rooms that bridge the charm of yesteryear with the modern day comforts and amenities you've come to expect from a luxury getaway. Stay in the main inn to enjoy elegantly furnished guest rooms, some featuring kitchenettes. Families looking for a little more rooms will enjoy the diverse array of accommodations to choose from including studios, townhouses, a deluxe suites with gas fireplaces, spa tubs, full kitchens and living rooms. You'll also have access to great resort amenities like an indoor heated swimming pool, both indoor and outdoor hot tubs, clay tennis courts and more. Start your day with a morning workout at the fitness facility, or just take walk along the winding Saco River. Great activities, amenities, and accommodations are waiting for you and your family in North Conway, New Hampshire! The Mt. Washington Valley and North Conway region was named one of the Top 25 Ski Towns in the World by National Geographic. Cranmore Ski Area is located just one mile from Eastern Slope Inn Resort. During the winter months, make sure to bring along your cross-country skis or snowshoes for a outdoor adventure. The Whitaker Woods feature over 60 kilometers of trails, and you'll be able to find one that fits your skill level. Bring the whole family for an escape to the Lakes Region of New Hampshire at Steele Hill Resort. Surrounded by Lake Winnipesaukee and Lake Winnisquan with the White Mountains and nearby forests peaking in the backdrop, Steele Hill Resort provides a beauty and comfort for all ages. With three lodging choices, Steele Hill East, West, and South, your family will fit comfortably in their one- to two-bedroom stays with kitchens and spacious living areas. You’ll enjoy breathtaking views while engaging in family friendly activities every day of your stay! No matter the season, there’s something exciting to explore. Year round, enjoy four pools, whirlpools, and saunas. Summers are the perfect time for a round on the golf course or hiking the trails. The snow beckons a snowmobile ride on the New Hampshire Statewide trail, snowshoeing, or some skating on the rink. 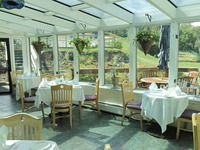 Steele Hill Resort is home to the Hilltop Restaurant where the whole family will enjoy fine, savory dishes. From fresh seafood to homemade soups and chef specialties, everyone's taste buds will be happy. Find the perfect four season family escape in the Mount Washington Valley at the New England Inn & Lodge. Surrounded by a wealth of natural treasures, the whole family will find something special year round. During the winter, take advantage of the snowfall with some downhill and cross country skiing or family tubing. Soak up the summer sun with a canoe ride down the Saco River or a hike through the White Mountain National Forest. After a day at play, you’ll need a warm and comfortable place to relax and unwind, and the New England Inn & Lodge has the accommodations to fit your family. Find comfort in the spacious and modern Garden Suites or Traditional Suites. The larger Lofty Contemporary Suites are ideal for a family who needs some extra space and luxury. No matter what lodging you choose, you’ll feel right at home with the New England Inn & Lodge! Fall is a special time to visit the New England Inn & Lodge with the changing colors in the Mount Washington Valley. Book your stay to experience this beautiful, natural change. If skiing and snowboarding are on your mind, the New England Inn & Lodge is the perfect stay with close access to Black Mountain, Cranmore Mountain, Attitash Mountain, and Wildcat Mountain. Outdoor adventure in the Lakes Region of New Hampshire awaits at Summit Resort. Conveniently located near Lake Winnipesaukee and the White Mountains, Summit Resort provides the ideal stay near all the area’s outdoor fun. Bike through the Gunstock Recreation Area or hike the New Hampshire Hiking Trails while the weather is still warm. Once the snow hits the ground, skiing and snowmobiling are favorites in the Lakes Region and fun for the whole family. While taking advantage of the area’s natural wealth, Summit Resort will provide a comfortable stay for everyone. With up to two-bedroom accommodations including kitchens and balconies with beautiful views, you’ll feel right at home. The resort is home to both an indoor pool with a slide and an outdoor pool when you need some time to let loose. Kids stay dry traversing the playground and exploring nearby hiking trails. Enjoy the wonders of New Hampshire at Summit Resort. During your stay at Summit Resort, check out these area attractions for added family fun: the Tanger Shopping Outlets, Castle in the Clouds, Polar Caves Park, and Ruggles Mine. The Naswa Resort is the perfect place to enjoy a beautiful lakeside family vacation with 1,000 feet of private, sandy beach and the sparkling waters of Winnipesaukee. Experience the comforts of home and variety with your choice of one to two bedroom cottages and spacious guestrooms at the inn. The Blue Bistro provides classic favorites that are sure to please, and NazBar and Grill is a fun and casual dining experience for everyone. Primly located, The Naswa Resort is near an array of family friendly attractions and activities. Take in the beautiful sites of the lake and White Mountains on the Winnipesaukee Scenic Railroad. Or, head out on the lake on the Mount Washington Cruise where you’ll view bridges, beaches, and lighthouses. Of course, you could always enjoy the fun of the lake with a jet ski or simply sit back and sink your toes into the sand. 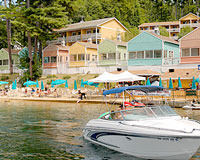 Summers are a great time to visit The Naswa Resort with a festival and entertainment happening nearly every week! Owners Jim and Fannie Salta, immigrants from Lesbos, Greece, are also the founders of the Natural Spring Water Company. A tranquil family escape only a short walk from the White Mountain Athletic Club and the Waterville Valley Golf Course, The Golden Eagle Lodge is your vacation home away from home. Individually decorated condominium suites provide comfortable accommodations that are sure to be the perfect fit for the whole family. Modern amenities and grand views of the New Hampshire landscape create a contemporary and charming atmosphere. The Golden Eagle Lodge is an ideal family destination every season of the year. The lodge becomes a winter wonderland when the snow falls where guests take advantage of the skiing and snowboarding opportunities as well as dog sledding and sleigh rides. The summer sunshine is the perfect addition to a hike on the trails, some pond fishing, or horseback riding through the mountains. With its beautiful mountain views and fairytale interior, The Golden Eagle Lodge is a great venue for a wedding, birthday, reunion, or other social event. Spend your next family adventure on the shores of Lake Winnipesaukee at Misty Harbor & Barefoot Beach Resort. Your whole family will find Misty Harbor a comfortable stay filled with recreational fun! Loaded with endless activities, Misty Harbor has both an indoor and outdoor pool, a Jacuzzi and sauna, tennis, basketball, volleyball, and shuffleboard courts, and of course, the sandy beach! And, their one- to two-bedroom suites provide a spacious and cozy stay, creating a feeling of home. Not only is there a long list of exciting activities to enjoy at Misty Harbor, the surrounding landscape and attractions provide something for everyone. Just a short walk from Misty Harbor is the Meadowbrook Musical Arts Center as well as skiing and snowboarding at Gunstock. Lake Winnipesaukee is the greatest place for snowmobiling and the private beach has the best views of the mountains. No matter which season you choose to stay, you’ll find Misty Harbor & Barefoot Beach Resort the perfect family destination. During your stay at Misty Harbor & Barefoot Beach Resort, check out the following attractions and conveniences that are only five minutes from the resort: Weirs Beach, boat rentals, state parks, hiking and biking trails, and shopping malls. Misty Harbor & Barefoot Beach Resort has motel accommodations located directly across the street from Lake Winnipesaukee. From soaring over the gorgeous New England landscape on a sailplane to hiking through stunning mountain trails, a unique New England experience awaits you and your family at The Mountain Club on Loon. This mountain-surrounded resort offers a wealth of activities within minutes of the property. Discover the mountainside on mountain bike or paddle down the rivers in a kayak. Test yourself from the Tree Top Zip Line, or hit the slopes for a great skiing adventure. Even better, The Mountain Club offers comfortable ski-in ski-out lodging perfect for relaxing at the end of a day of excitement. Their comfortable rooms offer stunning mountain views and special touches like full kitchens or private balconies that will make you feel right at home. The whole family will enjoy a dip in the outdoor heated pool or hot tub or enjoy laughs around the fireplace. All this and more awaits you at The Mountain Club on Loon. Relax and let go at the Spa and Health Club at The Mountain Club on Loon. Enjoy a fine European style spa experience filled with massage, wraps, and more. Dining is made easy at The Mountain Club on Loon with two dining options including The Black Diamond Pub and Seasons Restaurant.